Make this oven roasted salmon dish tonight because two is better than one. 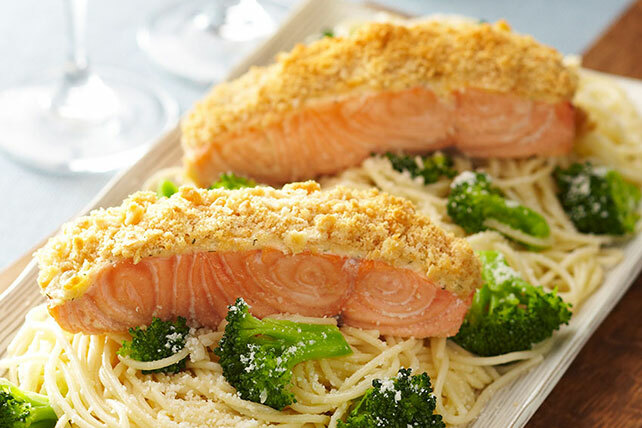 You'll wow your guest with culinary skills when you make this Oven-Roasted Salmon for Two. Mix mayo, mustard and dill until blended. Place fish in shallow ovenproof dish; drizzle with lemon juice. Spread with mayo mixture; sprinkle with cracker crumbs. Bake 12 to 14 min. or until fish flakes easily with fork. Meanwhile, cook pasta in large saucepan as directed on package, omitting salt and adding broccoli to the boiling water for the last 2 min. Drain pasta mixture in colander, reserving 2 Tbsp. of the cooking water. Heat oil in same saucepan on medium heat. Add garlic; cook and stir 1 min. Add pasta mixture and reserved cooking water; toss to coat. Top with cheese. Serve with fish. Prepare using 1/4 lb. of your favorite pasta. Serve with a side green salad tossed with your favorite KRAFT Dressing.